PARIS - Lucas Pouille's lopsided victory in the decisive fifth rubber on Sunday earned France their 10th Davis Cup, and first in 16 years, as they overshadowed Belgium 3-2 in the final in French northern city of Lille. 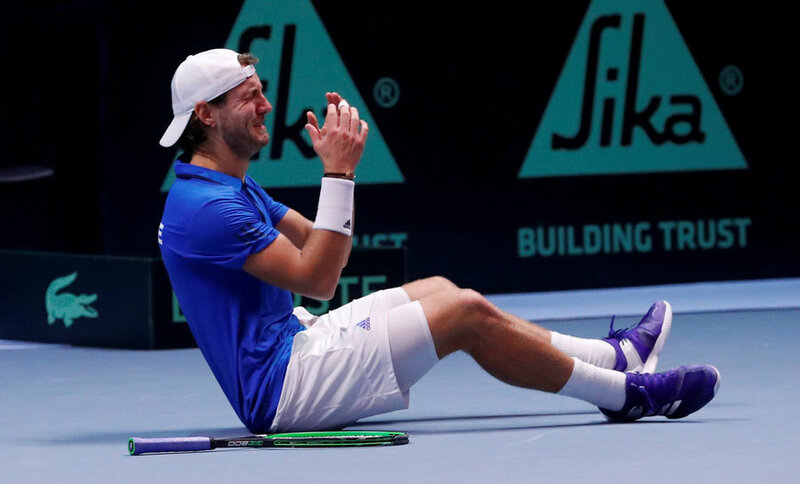 Pouille overwhelmed Steve Darcis 6-3, 6-1, 6-0 to seal the win for France, who joined Britain on third for the most Davis Cup titles, following United States (32) and Australia (28). France skipper Yannick Noah, who took the helm two years ago, said the victory ended the "losing culture", referring the team's losses in 2002, 2010 and 2014 finals. Pouille kicked off the hosts' quest for the trophy on Friday, while losing to Belgium's top-ranked David Goffin in straight sets. Goffin's French counterpart Jo-Wilfried Tsonga leveled the score, before Richard Gasquet and Pierre-Hugues Herbert put France ahead in their doubles debut on Saturday. Tsonga missed out the chance to secure the title after falling short against ATP Finals runner-up Goffin 7-6 (7/5), 6-3, 6-2. Pouille withstood huge pressure and gave crowds at the Stade Pierre-Mauroy every reason for cheering, as he dominated throughout the decider against Davis Cup specialist Darcis, who maintained a perfect record in previous Davis Cup fifth rubbers. World No 7 Goffin scored two points in the final this weekend, while for Belgium, the first title at the tournament is still a step away.